Saturday Morning Slam 03-16-13 - WrestleCrap - The Very Worst of Pro Wrestling! WILL CARTWHEELING MAYHEM TAKE OVER OUR FAVORITE SHOW??? 1) We wasted zero time getting to the point. You have no idea how many times I’d love those never ending opening Raw segments cut to a half minute. Who’s with me? 2) Mick Foley should be GREAT on this kids show. I mean, I’d seriously have a tough time coming up with anyone who can play a goofball boss designed to appeal kids better than this guy. AND he’s written children’s books, so maybe we’ll get a new Storytime with Uncle Mick segment. Ah, just look at him. He looks Muppet-tastic in his ill-fitted suit (which from this point forward I am going to pretend are Garanimals). Ok, I admit – when I first heard about a GM for this show, I hated the idea. Now, however, I am completely in favor of this. However, not everyone is in agreement! 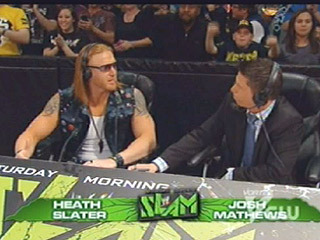 Heath Slater (here courtesy of the SMS Commentator Wheel of Misfortune™) for one is “heartbroken” over not being selected. “C’mon MAN!” poor Heath whines. 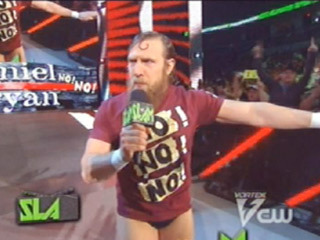 But he’s not the only one, as Daniel Bryan shows up to voice his displeasure as well. 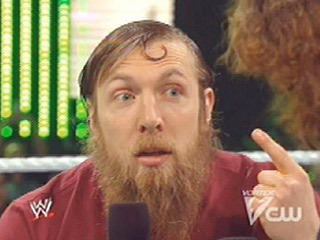 Daniel Bryan and his incredibly incredible hair, which now sports a curly q. Just when I think this man cannot possibly get any more amazing, how pulls out a do’ that is 50% Oompah Loompah and 50% Lollipop Guild. That is AMAZING. Seriously, I cannot stop staring at it. I’m half tempted to go buy a bad toupee and glue it to my head just so I can walk around looking like that myself. I know there are a lot of self-professed wrestling fans out there who’ve never watched this show, and I cannot get over what they are missing out on. I mean, come on. As The Dazzler (remember, that is his official SMS handle!) pleads his case, even Mick is having a nearly impossible time holding it together. How he didn’t lose it altogether as D-Bry goes into a troll-like fit is beyond me. Mick notes that although The DAZZLER (!!!!) has anger management problems, he does have one thing going for him, and that’s passion. 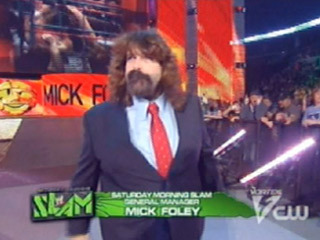 Passion, Foley notes, that may be good for someone to be his assistant on the show. A sly smile crosses D-Bry’s face, followed by what can only be dubbed SHIFTY EYES. Ok, this guy has now morphed into an evil troll AND stolen from The Simpsons in the span of about 30 seconds. He is seriously challenging Steve Austin (or is it Bret Hart? Rock maybe?) for my all time favorite wrestler this week. This discussion is sadly cut short by Dolph Ziggler, who is now sporting clothes that girls in my middle school used to wear. Note I’ve not been in middle school for like 30 years. And we immediately go to commercial. 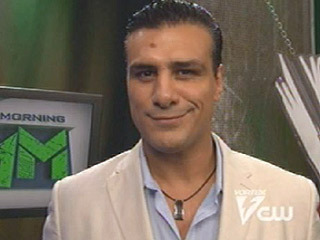 Which is followed by Alberto Del Rio, who is seriously one of the worst baby faces I’ve ever seen (and yes, I am counting the Miz) smirking and telling us to not try his moves at home. Long story short, Mick’s definition of “right now” and mine are pretty different. Finally, though, we get back to the arena, where the two go for a lock up, but The Dazzler drops to a knee and does what can only be termed the worst Ric Flair strut in history. So the two have the match you’d expect, which is great. The only thing missing is Bryan rolling himself up into a ball so that he can’t be pinned. This show so far has been pretty much perfect, sans Kane on commentary explaining to us how the kids really deserve an inferno match. Or Santino telling us who the MEAN one is. Still, Heath is pretty good here, as he keeps defending 3MB’s lack of a single by asking Josh repeatedly to give him a beat. Yeah, can’t believe people would watch Raw over this. And hey, remember a couple weeks ago where Dolph was doing situps and I said how his foe needed to roll him up? I don’t want to say Mr. Danielson is a fellow Crapper or anything, but…ummm…I actually don’t have a way to finish that sentence. Sadly, that’s not the pin, but a Frankensteiner gets it. I should note, the move is called as such during a replay package, so I can only hope that Big Poppa Pump is on his way in soon. That could seriously be the only thing that could possibly make this impossibly great show any better. Backstage Mick meets with Brodus Clay and Tensai, and tells him this dancing is inadequate and juvenile. “Lacking,” he continues. Lacking some DUDE LOVE DANCE MOVES! This show just keeps getting better and better. The Colons and Rosa Mendez show up to scream at the trio in what I can only assume (and by ‘assume’, I likely mean ‘pretend’) is an hispanic profanity-laden tirade. And those “shorts” Rosa is wearing are anything BUT G-rated. This somehow leads to a series of bear puns that had RD Jr. rolling on the floor. What can you say? They know their target audience. 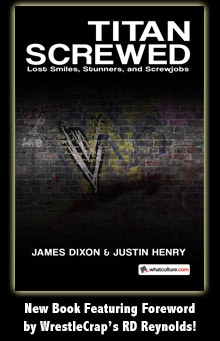 The Funkasaurus and Sweet T come down to the ring with Cameron and Naomi, and as they shuck and jive Heath continually points out them missing various steps. 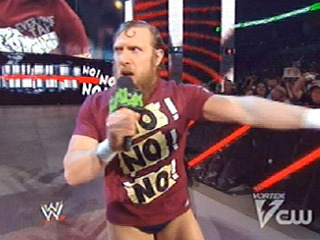 He didn’t suggest it, but I think a SMS dance off with these two against 3MB is LONG overdue. The squash is stopped for a moment by an Epico cheap shot, but well, you can guess how that goes. Yeah, what could he do but shrug his shoulders. A double splash finishes things up. Now where have I seen that before? If I were a WWE employee, I’d never want to be on any other show ever. Great show this week, and I cannot wait to see what happens next week. Seriously, when was the last time you could say that about YOUR favorite wrestling show? 13 Responses to "Saturday Morning Slam 03-16-13"
So. I’m going to start watching this show now. You’ve won me over. I’ve watched every Saturday Morning Slam since it debuted. And I too enjoy every minute of it. Come to think of it more, Tensai was kind of looking like Shredder when he first came back last year. Me too, although I’m not a morning person on Saturdays, I’ll definitely DVR it. Well, if that isn’t a reason to relocate, then I don’t know what is! The fact that we don’t get the CW where I live greatly disappoints me and I really need to find a way to rectify this now. I just can’t believe WWE and CW would allow a not-so-subtle gay culture reference to air on the show, and many times at that! In gay culture, a “bear” is a big, burly, hairy guy. So when Tensai, Brodus, and Mick referred to themselves as “bears”, I nearly spit out my Lucky Charms! Anyway, this was an excellent episode. Much better than most of the ones that have aired over the past 2-3 months. Man I was feeling like crap today, but just reading this write up had me laughing and feeling much better. I need to watch this show more often. Comparing the inept “comedy” segments on Raw to this show…it’s clear as per usual that no matter what, the product is infinitely better when the talent are allowed to be themselves and do their own thing. The strut that Bryan Danielson (Daniel Bryan is an aweful name) does reminded me more of Buff Bagwell than Flair because of the flex at the end. I hope he is imitating Flair. 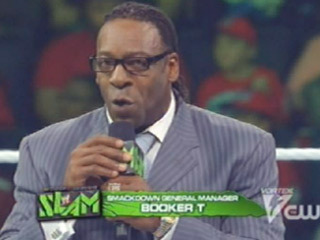 I pray he is imitating Flair because no one needs to be imitating Bagwell. INDUCTION: The Kiss That Never Happened – An Awesome Angle Disappeared Like a Ghost on All Hallow’s Eve!